Cutback in H-1B Visas Did Not Raise Employment for Natives, by Steve Maas, NBER Digest: In response to concerns that foreign workers were taking jobs from Americans, especially in high-technology fields, Congress cut the annual quota on new H-1B visas from 195,000 to 65,000, beginning with fiscal year 2004. A study by Anna Maria Mayda, Francesc Ortega, Giovanni Peri, Kevin Shih, and Chad Sparber, based on data for the fiscal years 2002-09, finds that the reduced cap did not increase the hiring of U.S. workers. In The Effect of the H-1B Quota on Employment and Selection of Foreign-Born Labor (NBER Working Paper No. 23902), the researchers examine data obtained through a Freedom of Information Act request to present the first assessment of the consequences of the cap reduction on various sectors of the skilled labor force. The H-1B program, which was launched in 1990, has provided foreign-born, college-educated professionals their main entry point into the U.S. market. As much as half the growth in America's college-educated science, technology, engineering and mathematics workforce in subsequent decades can be attributed to H-1B workers. Since the cap was tightened in 2004, firms hired between 20 and 50 percent fewer new H-1B workers than they might have hired had it remained at 195,000 visas per year. The researchers find, however, that the reduced pool of foreign workers did not lead firms to hire more Americans, and conclude that this suggests "low substitutability between native-born and H-1B workers in the same skill groups." The cap only applies to for-profit companies, not to new employees of educational institutions or nonprofit research institutions. The researchers also find that the quota reduction resulted in changes to the composition of new visa holders and the companies that hired them. Employment losses were concentrated at the lowest and highest ends of the wage scale, leading H-1B workers to become more concentrated among workers with mid-level skills. "The binding H-1B cap reduced the number of workers who were likely to have been among the most talented and productive foreign individuals seeking U.S. employment." Yet these are just the workers who might have contributed technological advances benefiting the entire economy. The cap led to an increased concentration of India-born workers in computer-related fields. The paper posits that Indians had a leg up on other foreign workers because of long-established labor networks in the software and semiconductor industries. On the employer side, the lower cap favored larger firms with greater experience navigating the bureaucracy of the visa program and with in-house legal teams that could handle the paperwork. This proved especially advantageous in fiscal years 2008 and 2009, when demand for visas was so high that the number of applications exceeded the quota level within the first week and the government resorted to a computerized random lottery system to allocate them. Smaller firms simply could not afford to spend money applying for visas when they were not sure whether they would obtain one. Know-Nothings for the 21st Century, by Paul Krugman, NY Times: These days calling someone a “know-nothing” could mean one of two things..., you might be comparing that person to a member of the Know Nothing party of the 1850s, a bigoted, xenophobic, anti-immigrant group that at its peak included more than a hundred members of Congress and eight governors. More likely, however, you’re suggesting that said person is willfully ignorant, someone who rejects facts that might conflict with his or her prejudices. After all, Ireland and Germany, the main sources of that era’s immigration wave, were the shithole countries of the day. Half of Ireland’s population emigrated in the face of famine, while Germans were fleeing both economic and political turmoil. Immigrants ... were portrayed as drunken criminals if not subhuman. They were also seen as subversives: Catholics whose first loyalty was to the pope. A few decades later..., immigration ... of Italians, Jews and many other peoples inspired similar prejudice. And here we are again..., there are always new groups to hate. But today’s Republicans ... aren’t just Know-Nothings, they’re also know-nothings. The range of issues on which conservatives insist that the facts have a well-known liberal bias just keeps widening. Think of where we’d be as a nation if we hadn’t experienced those great waves of immigrants driven by the dream of a better life. Think of where we’d be if we hadn’t led the world, first in universal basic education, then in the creation of great institutions of higher education. Surely we’d be a shrunken, stagnant, second-rate society. Trumpism is as an attempt to narrow regional disparities, not by bringing the lagging regions up, but by cutting the growing regions down. For that’s what attacks on education and immigration, key drivers of the new economy’s success stories, would do. So will our modern know-nothings prevail? I have no idea. What’s clear, however, is that if they do, they won’t make America great again — they’ll kill the very things that made it great. Dreamers, Liars and Bad Economics, by Paul Krugman, NY Times: Does it matter that Jeff Sessions, the attorney general, tried to justify Donald Trump’s immigration cruelty with junk economics? It’s definitely not the main issue. Trump’s decision to rescind the Deferred Action for Childhood Arrivals policy is, above all else, immoral. The 800,000 beneficiaries of DACA — the so-called Dreamers — have done nothing wrong; they came to the United States illegally, but not of their own volition, because they were children at the time. They are, according to all available data, an exemplary segment of our population: hard-working young people, many seeking to improve themselves through higher education. They’re committed to the values of their home — because America is their home. President Trump this week is expected to make changes to the Deferred Action for Childhood Arrivals immigration policy, also known as DACA. I join hundreds of university leaders as well as local, state, federal, and business leaders in strongly urging President Trump to continue this program. I also write to let our students know that we support them, and to provide information about where our students and their families can go for assistance, should the need arise. In a world full of ambiguities, there is no ambiguity for me about the importance of continuing DACA. My view of morality dictates that young people, many of whom were brought here as infants or toddlers, must be allowed to remain in the United States to learn, work, and make a life for themselves. The United States is their home. To uproot them would be wrong. Period. But the argument for DACA doesn’t just rest on principles of morality; it is also good for our country. One of the reasons the United States became the greatest nation in the world is because it was founded, built, and shaped by immigrants. Millions and millions of people, including all of my grandparents, risked everything to come to the United States to escape religious, ethnic, and political oppression or to seek out a better life for their children. The very act of coming here showed grit and determination, the willingness to assume risk, and courage—just the skills necessary to build our nation. The future of our nation’s economic prosperity also depends upon embracing immigrants and making sure that they are educated to become productive citizens and positive contributors to the economy. Birthrates are declining among our country’s native-born, and immigrants currently make up about 13 percent of the workforce. To uproot young immigrants from their schools and jobs or to force them into the shadows is the equivalent of shooting ourselves in our collective feet. Regardless of what happens in our nation’s capital, I want to again make very clear that the University of Oregon supports every student, regardless of immigration status. Every person on our campus is valued and welcomed because of and not despite their diversity of thought, race, culture, background, religion, gender identity, sexual orientation, and birthplace. Our many differences enrich this institution’s learning environment, enhance the student experience, and are essential to our mission of teaching, research, and service. The University of Oregon will not share with immigration enforcement any information on the immigration status of students unless required by court order. For current information on the status of DACA and frequently asked questions about immigration issues, please see the Immigration FAQ webpage. For additional information on the UO's support for DACA students, please visit the UO DREAMers Workgroup website. Should an immigration official ask for information about a UO student, employee, or visiting scholar, please immediately contact the Office of the General Counsel at 541-346-3082 or gcounsel@uoregon.edu. In the coming weeks and months, I urge everyone in our community to reach out and embrace those students who now face the uncertainty of knowing whether they will be able to remain in the United States. As I have repeated on many occasions—we are a family. Families take care of each other, and we will do everything in our power to ensure that all of our students are supported. The Long-Run Effects of Immigration during the Age of Mass Migration, by Jay Fitzgerald:Studying immigrant flows during the period of highest immigration in U.S. history, Sandra Sequeira, Nathan Nunn, and Nancy Qian find that counties that received large influxes of immigrants experienced both short- and long-term economic benefits compared with other regions. In Migrants and the Making of America: The Short- and Long-Run Effects of Immigration during the Age of Mass Migration (NBER Working Paper No. 23289), they report that these benefits were realized without loss of social and civic cohesion and the long-term benefits persisted to the dawn of the 21st century. U.S. counties that received larger numbers of immigrants between 1860 and 1920 had higher average incomes and lower unemployment and poverty rates in 2000. The researchers recognize that immigrants may have been drawn to locations with particular attributes, and that these attributes may also have contributed to those locations' subsequent growth. They therefore focus on differences in the dates on which counties became connected to the railway network, which made it much easier for immigrants to reach a particular location, as a source of quasi-random variation in immigrant inflows. Using census data along with historical railway maps and other source information, the researchers track county-level immigration, along with the decade-by-decade fluctuations in immigrant flows to the United States. The gradual expansion of railway networks, which connected only 20 percent of the nation in 1850 but 90 percent by 1920, together with the timing of waves of immigration, provide variation in how accessible different locations were to immigrants from 1850 to 1920. A central finding is that the economic benefits of immigration were significant and long-lasting: In 2000, average incomes were 20 percent higher in counties with median immigrant inflows relative to counties with no immigrant inflows, the proportion of people living in poverty was 3 percentage points lower, the unemployment rate was 3 percentage points lower, the urbanization rate was 31 percentage points higher, and education attainment was higher as well. The researchers do not find any cost of immigration in terms of social cohesion. Counties with more immigrant settlement during the Age of Mass Migration today have levels of social capital, civic participation, and crime that are similar to those of regions that received fewer immigrants. Measuring the short-term impacts of immigration from 1850 to 1920, the researchers find a 57 percent average increase by 1930 in manufacturing output per capita and a 39 to 58 percent increase in agricultural farm values in places that received the median number of immigrants relative to those that received none. Though some of the counties studied show a lower rate of literacy due to the influx of immigrants, many of whom did not speak English, the researchers find that illiteracy declined steadily over the years and that there was an increase in innovation activity, as measured by patents per capita, in counties with large immigrant populations. The long-run positive effects of immigration in counties connected to rail lines appear to have arisen from the persistence of the short-run benefits, particularly greater industrialization, agricultural productivity, and innovation. "Taken as a whole, our estimates provide evidence consistent with a historical narrative that is commonly told of how immigration facilitated economic growth," the researchers conclude. "Despite the unique conditions under which the largest episode of immigration in U.S. history took place, our estimates of the long-run effects of immigration may still be relevant for assessing the long-run effects of immigrants today." Immigrants and Firms' Outcomes: Evidence from France, by Cristina Mitaritonna, Gianluca Orefice, and Giovanni Peri, NBER Working Paper No. 22852 Issued in November 2016: In this paper we analyze the impact of an increase in the local supply of immigrants on firms’ outcomes, allowing for heterogeneous effects across firms according to their initial productivity. Using micro-level data on French manufacturing firms spanning the period 1995-2005, we show that a supply-driven increase in the share of foreign-born workers in a French department (a small geographic area) increased the total factor productivity of firms in that department. Immigrants were prevalently highly educated and this effect is consistent with a positive complementarity and spillover effects from their skills. We also find this effect to be significantly stronger for firms with low initial productivity and small size. The positive productivity effect of immigrants was also associated with faster growth of capital, larger exports and higher wages for natives. Highly skilled natives were pushed towards firms that did not hire too many immigrants spreading positive productivity effects to those firms too. Because of stronger effects on smaller and initially less productive firms, the aggregate effects of immigrants at the department level on average productivity and employment was small. The Slump in Undocumented Immigration to the United States: Immigration is a challenging and often controversial topic. We have written some on the economic benefits and costs associated with the inflows of low-skilled (possibly undocumented) immigrant workers into the United States here and here . 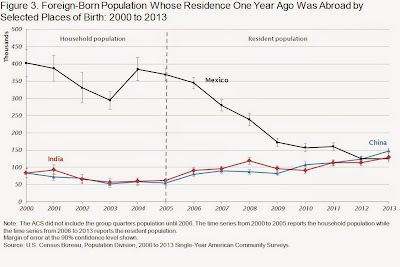 In this macroblog post, we discuss some interesting trends in undocumented immigration. There are no official records of undocumented immigration flows into the United States. However, one crude proxy for this flow is the number of apprehensions at the U.S. border. As pointed out in Hanson (2006), the number of individuals arrested when attempting to cross the U.S.-Mexico border, provided by the Department of Homeland Security (DHS), is likely to be positively correlated with the flows of attempted illegal border crossings (see chart 1). The apprehensions series displays spikes that coincide with well-known episodes of increased illegal immigration into the United States, such as after the financial crisis in Mexico in 1995 or during the U.S. housing boom in the early 2000s. Importantly, the series also shows a sharp decline in the flows of illegal immigration at the U.S.-Mexico border during the last recession, and those flows have remained at historically low levels since then. A better proxy for illegal immigration from Mexico would adjust the number of apprehensions for the intensity of U.S. border enforcement (for example, the number of border patrol officers). The intuition is straightforward: for the same level of attempted illegal crossings, greater enforcement is likely to result in more apprehensions. Chart 2 shows the border patrol staffing levels as an indicator of enforcement intensity. As the chart shows, the sharp decrease in apprehensions after the Great Recession occurred despite a remarkable increase in border enforcement, indicating that the decline in migration flows in recent years may have been even more abrupt than implied by the (unadjusted) border apprehensions shown in chart 1. The measure of inflows shown in chart 1 is largely consistent with estimates of the stock of undocumented immigrants in the United States, such as those provided by a new study by the Pew Research Center based on data from the U.S. Census Bureau. After having peaked at 12.2 million in 2007, the stock of unauthorized immigrants fell during the Great Recession and remained stable afterwards, most recently at 11.1 million in 2014. Also, the composition of this stock has shifted since the Great Recession. Although the population of undocumented Mexican immigrants fell by more than one million from its 6.9 million peak in 2007, the number of undocumented immigrants from Asia, Central America, and sub-Saharan Africa remained relatively steady as of 2014 and even increased in some cases. For example, the population of unauthorized immigrants from India rose by about 130,000 between 2009 and 2014. However, a lot of this type of unauthorized immigration is a result of overstayed visas rather than from people crossing the border without a visa. What do these numbers suggest about the future? It is likely that the flows of undocumented immigrant labor between Mexico and the United States reflect differences in demographic patterns and economic opportunities between the two economies. In the United States, the baby boom came to an abrupt halt in the 1960s, causing a notable slowdown in the native-born labor supply two decades later. In contrast, Mexico's fertility rate remained high for much longer, hovering at 6.7 births per woman in 1970 versus 2.5 in the United States (see chart 3). Mexico's labor force expanded rapidly during the 1980s, which, juxtaposed with the Mexican economic slump of the early 1980s, unleashed a wave of Mexican migration to the United States (Hanson and McIntosh, 2010). Also encouraging this flow was the steady U.S. economic growth during the "Great Moderation" period from the mid-1980s up through 2007 (Bernanke, 2004). More recently, however, Mexico's fertility rate has fallen (as in some Central American economies), and economic growth there has mostly outpaced that of the United States. 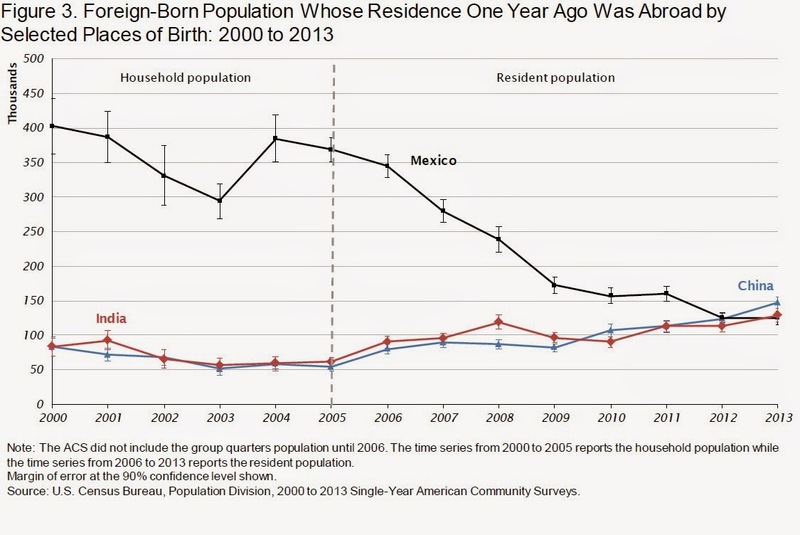 Therefore, it is perhaps not too surprising that demographic trends—along with greater enforcement—have caused the inflows of undocumented migration at the U.S.-Mexico border to slow in recent years. Shifts in demographic and economic factors across countries are likely to continue to influence undocumented immigration in the United States. Note: The views expressed here are those of the authors and do not necessarily reflect the views of the Federal Reserve Banks of Atlanta or Boston. Hello World (again): About 10 years ago, I had a blog that ran for about a year or so. It quickly began to consume too much of my time, and I realized that I could not be a heavy blogger and a full-time researcher at the same time. So I stopped blogging after a while. Immigration is back big time. I’ve been dragged into a public debate over some work I did last summer. And I have a book coming out in the fall that hopes to clarify many of the issues in the immigration debate. So I’m going to try blogging one more time. I’ve learned my lesson; I don’t expect to be blogging daily. But I suspect that the book will provoke some reactions–and the election is coming up as well. So come summer/fall I may be hanging around here more than just a bit. I then spent the entire summer working time-and-a-half on my Mariel paper. The paper went through several rounds. I got a lot of feedback from many friends who read early drafts. And I even did something that I had never done before: I hired someone to replicate the entire exercise from scratch just to make sure it was right! The paper came out as an NBER working paper in September 2015. At least in my corner of the universe, it created a disturbance in the force reminiscent of the destruction of Alderaan, leading to a debate in the past few weeks (here’s the Peri-Yasenov criticism) and to my writing a follow-up paper showing that the critics are wrong. ... And here is a popular piece I published in National Review that summarizes my take on what is going on. The critics harp on the fact that my sample of prime-age, non-Hispanic working men is small (which it is, as I explicitly noted in my original paper). But they ignore that I report many statistical tests showing the post-1980 wage drop in Miami to be statistically significant, despite the small samples. After everything is said and done, it surely seems as if something happened to the low-skill labor market in Miami after 1980, and that something depressed low-skill wages for several years. This fact has a really interesting implication. Suppose that the Mariel natural experiment is giving us the correct estimate of the wage depression. We may then be severely understating the economic gains from immigration. Is Donald Trump Right to Call NAFTA a ''Disaster''? "It's a disaster. ... We will either renegotiate it, or we will break it. Because, you know, every agreement has an end. ... Every agreement has to be fair. Every agreement has a defraud clause. We're being defrauded by all these countries." I also talk about immigration. The labor market effect of opening the border to immigrant workers, by Andreas Beerli and Giovanni Peri, Vox EU: The case for immigration restrictions is periodically debated in the political arena. The refugee crisis in southern Europe in recent months and the increased number of asylum seekers, who may turn into undocumented economic immigrants, has spurred discussion for stricter border enforcement and controls. In the UK, David Cameron promised few years ago to bring annual net migration down to ‘tens of thousands’ and put a cap on skilled non-European immigrants. With the British economy recovering, the cap has become binding for the first time in June of this year. Firms report problems in finding the right type of workers (Economist 2015a), yet relaxing immigration restrictions has little to no support among parties in the UK (Economist 2015b). In February 2014, Swiss voters narrowly approved a referendum to curb immigration from the EU after resentment to immigration grew, following the opening of labour markets to European workers (New York Times 2014). The effects of immigration restrictions on the inflow of immigrants and, in turn, on native workers’ employment outcomes are prominently discussed among policymakers. In spite of high sounding statement about the need of ‘pulling up the draw-bridge’ to avoid a flood of immigrants who can take away jobs, there is little direct evidence in the economic literature on how more open immigration policies affect immigration flows and, in turn, native labor market outcomes. Existing studies have analyzed the effects of immigration flows, comparing regions that receive more or fewer immigrants within a country, and interpreting the differences in outcomes as driven by immigration. However, examples in which different policies were adopted in otherwise similar regions – allowing a causal analysis of immigration policies on flows and on native labor markets – are rare. The literature has leveraged the tendency of immigrants to settle in regions with a network of compatriots (e.g. Card 2001, Peri and Sparber 2009, Dustmann et al. 2013) or it has used ‘push episodes’ from sending countries such as the collapse of the Soviet Union (Borjas & Doran 2015) or the wave of refugees from Cuba (Card 1990) to learn about their labor market effects. These episodes, however, are not under the control of the receiving country and therefore from them we do not learn much about the effectiveness and labor market consequences of different immigration policies. In a recent paper, we exploit the Swiss integration into the European labor market after 1999 and study the causal effect of removing restrictions on immigrant flows and on native employment and wages (Beerli and Peri 2015). The Swiss case was unique in that two different parts of the country experienced different timing in the implementation of the free movement policy. Labor market access for cross-border workers (foreign workers commuting from Italy, France, Germany, and Austria), was gradually eased beginning in 1999 and fully liberalized in 2004. Labor market access for other immigrants, who intended to work and settle in Switzerland, was also eased between 1999 and 2007 but symmetrically in all regions. Figure 1 displays the evolution of the labor force share of new immigrants in border and non-border regions (top panel) and the difference between them (bottom panel) during the period 1994-2010. The figure shows that the share of new immigrants moved together prior to 1999 (pre-reform), with a difference around 7 percentage points. Between 1999 and 2010, however, the share of new immigrants increased from 12.6% to 18.2% in the border regions, and from 5.5% to 7.4% in the non-border regions. Hence, new immigrants as share of the workforce increased by 3.7 percentage points more in the border compared to the non-border region. A more rigorous regression exercise yields a similar finding. The difference in share of new immigrants between border and non-border regions was stable prior to 1999 but it increased thereafter by about 4 percentage points up until 2010. Figure 2 shows that the cumulated gap in immigrant share, after controlling for several labor market characteristics, was significantly different from 0 for the first time in 2004 and remained significant after 2007. Notes: The figure plots coefficients (straight line) and the 5%-confidence interval (dashed lines) of a difference-in-difference estimate with immigrants as share of labor force and including municipality and year fixed effects as controls for local, industry-driven demand shocks. Having established that relaxing the restrictions on EU immigrants induced a significant growth, although certainly not a flood of immigrants, the next question we tackle is whether and how this influx affected natives’ labor markets. We exploit the same differential policy treatment between border and the non-border regions and find that average wages and hours worked by natives were not affected by it. To explore this puzzle, we investigate whether immigration had an effect on the job specialization of natives. Previous research (Peri and Sparber, 2009, 2011, Foged and Peri 2013) suggests that natives’ job specialization is likely to respond to the inflow of immigrants. As more immigrants take jobs, natives move to occupations where competition from immigrants is lower and complementarity effects are stronger. We find that highly educated natives were able to climb into higher management positions in response to the inflow of similarly educated immigrants, explaining some of their wage gains. On the other hand, middle-educated natives did not upgrade their positions but, instead, were reallocated to less-challenging job tasks and were replaced by immigrants in the ‘intermediate task’ range. So while in general natives responded to immigrant inflow, highly educated experienced an ‘upgrade’ of their jobs while middle-educated did not. First, by directly tackling immigration policies, we see that fully opening the border to neighbor countries increased immigrants only by 4 percentage points of the labor force over eight years. The recent research in this area has recognized the importance of looking at policy changes within countries to learn about their causal impact on foreign workers and labor markets. Dustmann et al. (2015), using an episode that allowed cross-border Czech workers into Germany, showed that in the short-run a substantial influx of unskilled workers reduced wages of unskilled young natives while unskilled older workers suffer employment declines. They explain this finding with the fact that old workers might either have larger labor supply elasticity (due to attractive outside options) or face larger wage rigidity than young workers. Our analysis shows that employment responses might also depend on the degree of occupation and task adjustment by native workers with different education levels. Such adjustment affects wage and employment effects. Beerli, A and G Peri (2015), “The Labor Market Effect of Opening the Border: New Evidence from Switzerland”, NBER Working Paper 21319. Borjas, G J and K Doran (2015), “Cognitive Mobility: Native Responses to Supply Shocks in the Space of Ideas”, Journal of Labor Economics, 33 (1), 109—145. Card, D (1990), “The Impact of the Mariel Boatlift on the Miami Labor Market”, Industrial and Labor Relations Review, 43 (2), 245—257. Card, D (2001), “Immigrant Inflows, Native Outflows, and the Local Labor Market Impacts of Higher Immigration”, Journal of Labor Economics, 19 (1), 22—64. Dustmann, C, U Schönberg and J Stuhler (2015), “Labor Supply Shocks and the Dynamics of Local Wages and Employment”, Manuscript, University College London, March 2015. Glitz, A (2012), “The Labor Market Impact of Immigration: A Quasi-Experiment Exploiting Immigrant Location Rules in Germany”, Journal of Labor Economics, 30 (1), 175—213. China and India Overtake Mexico for Inflow of Foreign-Born US Residents: During my adult life, the main source of immigration to the U.S. has always been Mexico. Thus, I was surprised to see that for 2013, immigration from China and India exceeded that from Mexico. The data comes from analysts at the US Census Bureau, Eric B. Jensen, Anthony Knapp, C. Peter Borsella, and Kathleen Nestor, and presented at a recent conference under the title, "The Place-of-Birth Composition of Immigrants to the United States: 2000 to 2013." Here's a takeaway figure. It's a measure of those who are foreign-born, and who were living outside the US a year ago--in other words, it's a measure of migration to the US in the previous year. Are Immigrants a Shot in the Arm for the Local Economy?, by Gihoon Hong and John McLaren, NBER Working Paper No. 21123: Most research on the effects of immigration focuses on the effects of immigrants as adding to the supply of labor. By contrast, this paper studies the effects of immigrants on local labor demand, due to the increase in consumer demand for local services created by immigrants. This effect can attenuate downward pressure from immigrants on non-immigrants' wages, and also benefit non-immigrants by increasing the variety of local services available. For this reason, immigrants can raise native workers' real wages, and each immigrant could create more than one job. Using US Census data from 1980 to 2000, we find considerable evidence for these effects: Each immigrant creates 1.2 local jobs for local workers, most of them going to native workers, and 62% of these jobs are in non-traded services. Immigrants appear to raise local non-tradables sector wages and to attract native-born workers from elsewhere in the country. Overall, it appears that local workers benefit from the arrival of more immigrants. How immigrants and job mobility help low-skilled workers, by Mette Foged, Giovanni Peri: Existing studies – largely based on the analyses of large immigration episodes (e.g. Friedberg 2001, Card 1991), and the experience of the US and the UK (Ottaviano and Peri 2012, Manacorda et al 2012) – show that immigration can be absorbed with small changes in employment and wages of natives. Suffer Little Children, by Paul Krugman, Commentary, NY Times: The Tenement Museum, on the Lower East Side, is one of my favorite places in New York City. It’s a Civil War-vintage building that housed successive waves of immigrants, and a number of apartments have been restored to look exactly as they did in various eras, from the 1860s to the 1930s... When you tour the museum, you come away with a powerful sense of immigration as a human experience, which — despite plenty of bad times,... was overwhelmingly positive. I get especially choked up about the Baldizzi apartment from 1934. When I described its layout to my parents, both declared, “I grew up in that apartment!” And today’s immigrants are the same, in aspiration and behavior, as my grandparents were — people seeking a better life, and by and large finding it. That’s why I enthusiastically support President Obama’s new immigration initiative. It’s a simple matter of human decency. But ... the proposition that we should offer decent treatment to children who are already here — and are already Americans in every sense..., that’s what Mr. Obama’s initiative is about. Who are we talking about? First, there are more than a million young people ... who came — yes, illegally — as children and have lived here ever since. Second, there are large numbers of children who were born here — which makes them U.S. citizens, with all the same rights you and I have — but whose parents came illegally, and are legally subject to being deported. What should we do about these people...? ... The truth is that sheer self-interest says that we should do the humane thing. Today’s immigrant children are tomorrow’s workers, taxpayers and neighbors. Condemning them to life in the shadows means that they will have less stable home lives than they should, be denied the opportunity to acquire skills and education, contribute less to the economy, and play a less positive role in society. Failure to act is just self-destructive. But... What really matters ... is the humanity. My parents were able to have the lives they did because America, despite all the prejudices of the time, was willing to treat them as people. Offering the same kind of treatment to today’s immigrant children is the practical course of action, but it’s also, crucially, the right thing to do. So let’s applaud the president for doing it. How immigration benefits natives despite labour market imperfections and income redistribution, by Michele Battisti, Gabriel Felbermayr, Giovanni Peri, and Panu Poutvaara, Vox EU: Immigration continues to be a hotly debated topic in most OECD countries. Economic models emphasising the benefits of immigration for natives have typically neglected unemployment and redistribution – precisely the things voters are most concerned about. This column analyses the effects of immigration in a world with labour market rigidities and income redistribution. In two-thirds of the 20 countries analysed, both high-skilled and low-skilled natives would benefit from a small increase in immigration from current levels. The average welfare gains from immigration are 1.25% and 1.00% for high- and low-skilled natives, respectively. Our analysis shows that immigration into imperfectly competitive labour markets need not be worsening labour market outcomes for natives. Instead, it can improve the job creation incentives of firms. Thus, measures that aim at eliminating the immigrant–native wage gap may hurt natives. This positive effect is threatened if immigrants are too often unemployed or if too many of them are unskilled. Policies reducing the rate of job loss for immigrants would therefore help natives. Finally, in contrast to widespread belief, immigrants do not seem to hurt low-skilled natives, even in the more realistic framework developed here. This is because immigration is often balanced between more and less educated, because its job-creation effect can help, and because redistribution towards immigrants is not as large as often suggested in the debate. The optimal number of immigrants: Hoover's Peregrine asked me to write an essay with the title, "What is the optimal number of immigrants to the U.S?" (Original version and prettier formatting here. Also a related podcast here.) My answer: Two billion, two million, fifty-two thousand and thirty-five (2,002,052,035). Seriously. Why the UK? Well, it seems really pretty country and none too crowded on “Masterpiece Theater.” The Netherlands is also attractive with 1,250 people per square mile, so maybe four billion. Okay, maybe more of the US is uninhabitable desert or tundra, so maybe only one billion. However you cut it, the US still looks severely underpopulated relative to many other pleasant advanced countries. Economics and the Immigration debate: As the storm force winds blew, I wondered to what extent the debates on immigration and austerity shared a common feature. In both cases economists might feel like someone trying to walk against high winds: it is hard, perhaps painful, and you seem to be getting nowhere fast. To be less metaphorical, in both cases the economic arguments seem to be irrelevant to the public debate, and the politicians want to go in the opposite direction to the one suggested by the economics. While I find the macroeconomics of austerity interesting (it’s my field), I believe the reasons why the economics is ignored are fairly straightforward and much less interesting. In the case of migration, I think understanding why the economics is ignored is much more of an intellectual challenge. ...when it comes to immigration – of the legal and illegal kind – the Lone Star Fed is not sitting with the Tea Party core. On the contrary, it has just published a paper – under the provocative title “Gone to Texas” – arguing that immigration is good for the local economy. And it rebuffs the idea that immigrants are stealing jobs from native-born Americans. On the contrary, it insists, they tend to boost growth in a win-win way. Now, if this conclusion had emerged in a state with few immigrants and plenty of unfilled jobs (think North Dakota), that might be unsurprising. But the picture that Fed researchers paint of Texas is eye-popping. Since 1990, the number of foreign-born people living there has jumped from 1.5 million to 4.3 million...”, and that “among large states, none has experienced a surge like Texas has, with immigrants rising from 9 per cent of the population in 1990 to 16.4 per cent in 2012”. Immigration, Class, & Ideology: ...the effects of immigration take place in a class-divided society. For those in power, the benefits - high profits - are quick and easy. But for those at the bottom end of the labour market, they are less pleasant. But it needn't be so. Imagine our retailer were a full-blooded worker coop. Workers would then think: "Isn't it great we don't have to that dangerous job now, so we can do nicer jobs and get a share of higher profits". And if redundancies are made, they'll be on better terms. (And of course, in a society not disfigured by class division, unemployment benefits would be higher). In this sense, it is obvious that immigration - insofar as it does worsen the condition of some workers (which is easily overstated) - is a class issue. Rather than ask: "why are immigrants taking my job?" Dave could equally ask: "why are there class divisions which prevent the benefits of migration flowing to everyone?" In this way, it is immigrants who get scapegoated rather than capitalists. The impact of immigrants – it’s not what you think, by Brian Keeley: In the land of tabloid terrors, immigrants loom large. Flick through the pages or online comments of some of the racier newspapers, and you’ll see immigrants being accused of stealing jobs or, if not that, of being workshy and “scrounging benefits”. New research from the OECD indicates that ... across OECD countries, the amount that immigrants pay to the state in the form of taxes is more or less balanced by what they get back in benefits. Even where immigrants do have an impact on the public purse – a “fiscal impact” – it amounts to more than 0.5% of GDP in only ten OECD countries, and in those it’s more likely to be positive than negative. In sum, says the report, when it comes to their fiscal impact, “immigrants are pretty much like the rest of the population”. The extent to which this finding holds true across OECD countries is striking, although there are naturally some variations. Where these exist, they largely reflect the nature of the immigrants who arrive in each country. ... Indeed, one objection that’s regularly raised to lower-skilled immigrants is the fear that they will live off state benefits. But, here again, the OECD report offers some perhaps surprising insights. It indicates that low-skilled migrants – like migrants in general – are neither a major drain nor gain on the public purse. Indeed, low-skilled immigrants are less likely to have a negative impact than equivalent locals. The striking thing about the United States, though, is that increasing ethnic and racial diversity hasn’t dampened our public investments. He goes onto provide evidence that a 1999 paper by Alberto Alesina, Reza Baqir, and William Easterly that came to the opposite conclusion had causality backwards. Correcting for this, he finds that "Among the 1,000 largest U.S. cities, those that rapidly diversified saw the same changes in their spending on those categories as did cities that did not diversify." What Immigration Reform Could Mean for American Workers, and Why the AFL-CIO Is Embracing It, by Robert Reich: Their agreement on is very preliminary and hasn’t yet even been blessed by the so-called Gang of Eight Senators working on immigration reform, but the mere fact that AFL-CIO President Richard Trumka and Chamber of Commerce President Thomas J. Donohue agreed on anything is remarkable. So they’ve compromised on a maximum (no more than 20,000 visas in the first year, gradually increasing to no more than 200,000 in the fifth and subsequent years), with the actual number in any year depending on labor market conditions... Priority would be given to occupations where American workers were in short supply. I can understand why it might have been advantageous from an evolutionary perspective for nature to make us care most about those who are closest to us. It seems like there are two ways to get beyond this tribalism. The first is to expand the definition of the tribe to include everyone. According to the column, and to economic theory and evidence more generally, open borders don't just benefit immigrants, they help everyone. Since immigrants benefit us all, the definition of the tribe should be expanded to include them. The second, which is also in the column, is to argue it's a moral issue. We can and should grow beyond the tribal instincts that lead to war and other problems, forget about borders of all types as a distinction for measuring costs and benefits of immigration, and treat everyone the same. Under the first approach, we care about people based upon what they can do to help us. Under the second, which I prefer, we care about people simply because they are people. Are Immigrants Taking Your Job? A Primer, by Catherine Rampell: Immigration reform is back on the table, reviving debates about whether immigration is good or bad for American-born workers. Tendency to fear is strong political influence, EurekAlert: It's no secret that fear is a mechanism often used in political campaigns to steer public opinion on hot-button issues like immigration and war. But not everyone is equally predisposed to be influenced by such a strategy, according to new research ... published in the American Journal of Political Science. At the macroeconomic level, Douglas Massey, founder of the Mexican Migration Project at Princeton University, has documented what he calls “net zero” migration. The population of undocumented immigrants in the US fell from 12 million to approximately 11 million during the height of the financial crisis (2008-09), he says. And since then, Mexicans without documents aren’t migrating at rates to replace the loss, creating a net zero balance for the first time in 50 years. ...The shift began as a result of the weak U.S. economy, but experts say anti-immigrant state laws, tougher U.S. border enforcement, and border violence are contributing factors as well. "The Impact of Immigration on Native Poverty"
The Impact of Immigration on Native Poverty through Labor Market Competition, by Giovanni Peri, NBER Working Paper No. 17570, November 2011: In this paper I first analyze the wage effects of immigrants on native workers in the US economy and its top immigrant-receiving states and metropolitan areas. Then I quantify the consequences of these wage effects on the poverty rates of native families. The goal is to establish whether the labor market effects of immigrants have significantly affected the percentage of "poor" families among U.S.-born individuals. I consider the decade 2000-2009 during which poverty rates increased significantly in the U.S. As a reference, I also analyze the decade 1990-2000. To calculate the wage impact of immigrants I adopt a simple general equilibrium model of productive interactions, regulated by the elasticity of substitution across schooling groups, age groups and between US and foreign-born workers. Considering the inflow of immigrants by age, schooling and location I evaluate their impact in local markets (cities and states) assuming no mobility of natives and on the US market as a whole allowing for native internal mobility. Our findings show that for all plausible parameter values there is essentially no effect of immigration on native poverty at the national level. At the local level, only considering the most extreme estimates and only in some localities, we find non-trivial effects of immigration on poverty. In general, however, even the local effects of immigration bear very little correlation with the observed changes in poverty rates and they explain a negligible fraction of them. "The Rhetoric of Closed Borders"
The rhetoric of closed borders, by Giovanni Facchini and Cecilia Testa, Vox EU: Illegal immigration is widespread. In 2008, approximately 12 million immigrants lived unlawfully in the US, and large numbers of undocumented foreigners resided also in other advanced destination countries (Fasani 2009, Triandafyllidou 2010). Understandably, illegal immigration has become a very prominent issue in the policy debate and a major challenge in the design of policies pursuing the control of the flows of migrants. Why do governments try to close (at least to some extent) their borders? And why do they fail to keep them “closed”? The first point can be easily understood by considering the redistributive effects of immigration. Despite an overall welfare gain for the receiving country, the benefits of migration tend to be unevenly distributed. The crudest representation of the costs and benefits of migration for the receiving country (leaving aside the obvious important benefits for the migrants themselves) boils down to a very simple arithmetic. The downward pressure migration puts on wages means larger profits for firms’ owners employing “cheaper work” and lower wages for the workforce employed in such firms. The crux of migration policy is striking a balance between these opposing interests: the fears of the numerous individuals (often the majority) who stand out to lose from migration (Facchini and Mayda 2008), against the pressures of organized pressure groups representing the firms who benefit from foreign work. This ultimately leads to a widespread use of restrictions to the free mobility of labor in order to achieve a desired migration target. Ironically, the Triangle building was considered a model of modern safety standards, compared to the dark and crowded working conditions of tenement apartment sweatshops common at the time. Triangle was a “fireproof” building, with freight elevators, high ceilings and windows that allowed light onto the factory floor. The fire that began at 4:30 pm 100 years ago today started on the 8th floor and spread quickly upwards, igniting machine oil and flammable piles of cotton scraps and shirtwaists on the factory floor. The workers rushed to escape but found the main stairs chained shut (the bosses didn’t want them taking breaks or stealing shirts and routinely searched them before they could leave the building.) While some made it out via the single freight elevator, others were pushed to their deaths in the elevator shaft. The flimsy fire escape came unmoored from the building in the heat, killing many more. Firemen could do little to help... The women trapped on the 9th floor began to jump out the windows... Thousands of New Yorkers out for a Saturday stroll though Washington Square Park witnessed the horrible scene. The factory owners on the top floor escaped out the roof and onto an adjacent building. They stood trial for criminal manslaughter but were acquitted; the jury wasn’t convinced that the owners knew the exit doors were locked. Still, the consequences of the fire were far-reaching. Public outrage led to more than 30 new laws passed within two years, creating new standards for minimum wages and maximum hours, encouraging collective bargaining, and addressing all the safety failures at the Triangle Factory. On this site, 146 workers lost their lives in the Triangle Shirtwaist company fire on March 25, 1911. Out of their martyrdom came new concepts of social responsibility and labor regulation that have helped make American working conditions the finest in the world. The fire was a terrible tragedy. But today we can be thankful for 100 years of development and public safety regulation that prevent workplace disasters like this one in New York City. "How Immigrants Create More Jobs"
How Immigrants Create More Jobs, by Tyler Cowen, Commentary, NY Times: In the campaign season now drawing to a close, immigration and globalization have often been described as economic threats. The truth, however, is more complex. Debates on immigration and labor markets reflect some common human cognitive failings — namely, that we are quicker to vilify groups of different “others” than we are to blame impersonal forces. Consider the fears that foreign competition, offshoring and immigration have destroyed large numbers of American jobs. In reality, more workers have probably been displaced by machines... Yet we know that machines and computers do the economy far more good than harm and that they create more jobs than they destroy. As a nation, we ... should be looking to immigration as a creative force in our economic favor. Allowing in more immigrants, skilled and unskilled, wouldn’t just create jobs. It could increase tax revenue, help finance Social Security, bring new home buyers and improve the business environment. The world economy will most likely grow more open, and we should be prepared to compete. That means recognizing the benefits — including the employment benefits — that immigrants bring to this country. "Illegal immigration: What's the real cost to taxpayers?" This history is forgotten in the angry debate over the cost to taxpayers of unauthorized immigrants and their children today. My recent column reporting that unauthorized immigrants were making unexpectedly large contributions to Social Security, for example, led to denunciations that I was being misleading by not looking at the total fiscal picture. A tough federal law passed in 1996 has since cut almost all benefits to unauthorized immigrants. Even the Center for Immigration Studies, which advocates forcing out immigrants here illegally, acknowledged that the average undocumented household in 2002 received fully 46 percent less in federal benefits than an American one. But this likely would go up with legalization. So, the main question may be: Are they deserving? Look around you at the people whose European-born ancestors were on the dole and overcrowding schools a century ago. You decide. The Effect of Immigrants on U.S. Employment and Productivity, by Giovanni Peri, FRBSF Economic Letter: Immigration in recent decades has significantly increased the presence of foreign-born workers in the United States. The impact of these immigrants on the U.S. economy is hotly debated. Some stories in the popular press suggest that immigrants diminish the job opportunities of workers born in the United States. Others portray immigrants as filling essential jobs that are shunned by other workers. Economists who have analyzed local labor markets have mostly failed to find large effects of immigrants on employment and wages of U.S.-born workers (see Borjas 2006; Card 2001, 2007, 2009; and Card and Lewis 2007). This Economic Letter summarizes recent research by Peri (2009) and Peri and Sparber (2009) examining the impact of immigrants on the broader U.S. economy. These studies systematically analyze how immigrants affect total output, income per worker, and employment in the short and long run. Consistent with previous research, the analysis finds no significant effect of immigration on net job growth for U.S.-born workers in these time horizons. This suggests that the economy absorbs immigrants by expanding job opportunities rather than by displacing workers born in the United States. Second, at the state level, the presence of immigrants is associated with increased output per worker. This effect emerges in the medium to long run as businesses adjust their physical capital, that is, equipment and structures, to take advantage of the labor supplied by new immigrants. However, in the short run, when businesses have not fully adjusted their productive capacity, immigrants reduce the capital intensity of the economy. Finally, immigration is associated with an increase in average hours per worker and a reduction in skills per worker as measured by the share of college-educated workers in a state. These two effects have opposite and roughly equal effect on labor productivity. "The Economics of Immigration Are Not What You Think"
The Economics of Immigration Are Not What You Think, by Robert J. Shapiro, NDN [CC]: Waves of new immigrants often spark economic anxiety and cultural discomfort, as well as occasional violence and wide-net crackdowns, on the Arizona model. Even here, a nation comprised almost entirely of immigrants and their descendents, we’ve seen these reactions not only in recent times but also a century ago, when waves of poor immigrants from Europe arrived here. With a hundred years’ distance, however, we can now see that those early waves of immigration were generally associated not with economic dislocation and national decline, but with extraordinary economic boom times and America’s emergence as the world’s leading economy. And for much the same reasons as a century ago, recent evidence indicates that the economic effects of the current waves of immigration are also largely positive. The New Policy Institute (NPI) asked me to review all of the available data and economic studies of recent U.S. immigration. With my colleague Jiwon Vellucci, we found, to start, that more than one-third of recent immigrants come from Europe and Asia, while less than 57 percent have come from Mexico and other Latin American nations. The popular portrait of recent immigrants is off-point in other respects as well. While more immigrants than native-born Americans lack high school diplomas, equivalent shares of both groups have college or post-college degrees. That finding should make it unsurprising that 28 percent of U.S. immigrants work as managers or professionals, including 38 percent of those who have become naturalized citizens or the same share as native-born Americans. Many Americans would probably acknowledge that their concerns about immigration lie principally with those who are undocumented. No one likes being reminded that the world’s most powerful nation hasn’t figured out how to effectively police its own borders. But the data also show that these undocumented people, who account for 30 percent of all recent immigrants, embody some traditional values much more than native-born Americans. For example, while undocumented male immigrants are generally low-skilled, they also have the country’s highest labor participation rate: Among working-age men, 94 percent of undocumented immigrants work or actively are seeking work, compared to 83 percent of the native born. One critical reason is that undocumented immigrants are more likely to support traditional families with children: 47 percent of undocumented immigrants today are part of couples with children, compared to just 21 percent of native-born Americans. The evidence regarding the impact of immigration on wages also turns up some surprising results. First, there’s simply no evidence that the recent waves of immigration have slowed the wage progress of average, native-born American workers. Overall, in fact, the studies show that immigration has increased the average wage of Americans modestly in the short-run, and by more over the long-term as capital investment rises to take account of the larger number of workers. Behind those results, however, lie winners and losers – although in both cases, the effects are modest. Among workers, the winners are generally higher-skilled Americans: For example, when a factory or hotel hires more low-skilled workers, demand also increases for the higher-skilled people who manage those workers or carry out other professional tasks for an enterprise that’s grown larger. The losers are generally the lower-skilled workers who have to compete for jobs with recent immigrants. But studies also show that immigration reform might well take care of most of those effects. Following the 1986 immigration reforms, for example, previously-undocumented immigrants experienced big pay boosts – as much as 15 or 20 percent – and immigrants who already had legal status saw hefty wage gains, too. But the reforms also led to higher wages for lower-skilled native-born Americans. One reason is that undocumented people who gain legal status can move more freely to places with greater demand for their skills, reducing their competition with native-born people with similar skills. More important, their new legal status confers certain protections such as minimum wage and overtime rules. Today, about one-fourth of low-skilled workers in large American cities are paid less than the minimum wage, including 16 percent of native-born workers, 26 percent of legal immigrants, and 38 percent of undocumented workers. Ending the ability of unscrupulous employers to recruit people to work for less than the minimum wage would not only raise the incomes of those currently paid less than the minimum wage. It also would ease downward pressures on the wages of other lower-skilled Americans, which comes from the below-minimum wage workers. This process is something we have refered to as "closing the 'trap-door' under the minimum wage." Looking again at immigrants generally, recent research also shows a strong entrepreneurial streak, with immigrants being 30 percent more likely than native-born Americans to start their own businesses. Nor are immigrants the fiscal drain that’s commonly supposed, at least not in the long term. In California and a few other states, immigrants today do entail a net, fiscal burden, principally reflecting the costs of public education for their children. But studies that use dynamic models to take account of the lifetime earnings of immigrants – most of whom arrive here post-school age and without elderly parents to claim Social Security and Medicare – show substantial net fiscal gains at the federal, state, and local levels. Political disputes are rarely settled by facts. Nevertheless, it’s reassuring to see that the humane and progressive approach to immigration is also a policy likely to produce good economic results for almost everyone. Why More Immigrants Are An Answer to the Coming Boomer Entitlement Mess, by Robert Reich I was born in 1946, just when the boomer wave began. ... Sixty years later, we boomers have a lot to be worried about because most of us plan to retire in a few years and Social Security and Medicare are on the way to going bust. I should know because I used to be a trustee of the Social Security and Medicare trust funds. Those of you who are younger than we early boomers have even more to be worried about because if those funds go bust they won’t be there when you’re ready to retire. It’s already starting to happen. This year Social Security will pay out more in benefits than it receives in payroll taxes. ... And it adds new urgency to reforming Social Security — a task the president’s commission on the nation’s debt is focusing on. Bernanke ... leaves out one other possible remedy that should be included in that combination: Immigration. I didn't expect this from Reich - he should know better than to blame the problem on demographics (e.g. see the graph here on the demographic issues, and here for the relative size of the Social Security and health care cost problems, e.g. "The fiscal gap does not arise, as many believe, primarily from the coming retirement of the baby boomers. Rather, the rate at which health-care costs grow will be the primary determinant of the nation's long-term budget picture."). I don't oppose more immigration, but trying to sell it to the public through scare tactics about social security is not the way to make the case. "Immigration and the Welfare State"
Immigration and the Welfare State, by Jeffrey Miron: Jason Riley has a nice column in today’s WSJ about the interaction between welfare and immigration policies. He correctly notes that immigrants to the U.S. do not come mainly for the welfare benefits, but he worries this could change as welfare policies, like Obamacare, expand. In countries such as France, Italy and the Netherlands, excessively generous public benefits have lured poor migrants who tend to be heavy users of welfare and less likely than natives to join the work force. Milton Friedman famously remarked, “you can’t have free immigration and a welfare state.” There is a tipping point, even if the U.S. has yet to reach it. Riley and Friedman may be right, but my hunch is that they have the sequencing backwards: we should liberalize immigration because it will restrain the welfare state. The European examples that Riley cites might seem to argue against this view, but these countries still restrict immigration significantly. My claim is that major expansions in legal immigration would cause substantially diminished support for generous welfare spending. 'Virtual' Immigration Continued Rising During Recession, by Sudeep Reddy, Real Time Economics: The global economic downturn spurred declines in physical immigration — the movement of people across borders — in 2008 and 2009. But a new Federal Reserve Bank of Dallas report says “virtual” immigration — moving the work rather than the workers — continued to grow. "The Economics and Policy of Illegal Immigration in the United States"
The Economics and Policy of Illegal Immigration in the United States, by Gordon H. Hanson: Executive Summary Policymakers across the political spectrum share a belief that high levels of illegal immigration are an indictment of the current immigration policy regime. An estimated 12 million unauthorized immigrants live in the United States, and the past decade saw an average of 500,000 illegal entrants per year. Until recently, the presence of unauthorized immigrants was unofficially tolerated. But since 2001, policymakers have poured huge resources into securing US borders, ports, and airports; and since 2006, a growing range of policies has targeted unauthorized immigrants within the country and their employers. Notwithstanding these efforts, no agreement has materialized on a system to replace the status quo and, in particular, to divert illegal flows to legal ones. Policy inaction is a result not only of a partisan divide in Washington, but also of the underlying economic reality that despite its faults, illegal immigration has been hugely beneficial to many US employers, often providing benefits that the current legal immigration system does not. "Immigration, Wages, and Compositional Amenities"
Immigration, Wages, and Compositional Amenities, by David Card, Christian Dustmann, and Ian Preston, NBER Working Paper No. 15521, November 2009 [Open Link]: Introduction Standard economic reasoning suggests that immigration, like trade, creates a surplus that in principle can be redistributed so all natives are better off (Mundell, 1957). In practice the redistributive mechanisms are incomplete so both policies tend to create winners and losers. Even so, public support for increased immigration is far weaker than for expanding trade. While the two policies have symmetric effects on relative factor prices, immigration also changes the composition of the receiving country’s population, imposing externalities on the existing population. Previous studies have focused on the fiscal externalities created by redistributive taxes and benefits (e.g., MaCurdy, Nechyba, and Bhattacharya, 1998; Borjas, 1999, Hanson, Scheve and Slaughter, 2005). A wider class of externalities arise through the fact that people value the ‘compositional amenities’ associated with the characteristics of their neighbors and co-workers. Such preferences are central to understanding discrimination (Becker, 1957) and choices between neighborhoods and schools (e.g., Bayer, Ferreira, and McMillan, 2007) and arguably play an important role in mediating views about immigration. Our empirical analysis leads to three main conclusions. First, we find that attitudes to immigration – expressed by the answer to a question of whether more or fewer immigrants from certain source countries should be permitted to enter, for example – reflect a combination of concerns over compositional amenities and the direct economic impacts of immigration on wages and taxes. Second, we find that the strength of the concerns that people express over the two channels are positively correlated. This means that studies that focus exclusively on one factor or the other capture a reasonable share of the variation in attitudes for or against increased immigration. Our third conclusion is that concerns over compositional amenities are substantially more important than concerns over the impacts on wages and taxes. Specifically, variation in concerns over compositional amenities explain 3-5 times more of the individual-specific variation in answers to the question of whether more or fewer immigrants should be permitted to enter than does variation in concerns over wages and taxes. Concerns over compositional amenities are even more important in understanding attitudes toward immigrant groups that are ethnically different, or come from poorer countries. Similarly, differences in concerns over compositional amenities account for about 70% of the gap between high- and low-education respondents over whether more immigrants should be permitted to enter the country. Differences in compositional concerns also explain most of the differences in attitudes between older and younger respondents. The age gap is a particular puzzle for models of immigration preferences that ignore compositional amenities, because many older people are retired, and face a much lower threat of labor market competition than young people. "Housing Starts, Remittances and Macroeconomic Developments"
Housing starts, remittances and macroeconomic developments, by Federico Mandelman: Recent evidence collected by the Dallas Fed's Pia Orrenius suggests that apprehensions of undocumented workers attempting to cross the U.S.–Mexican border are a good predictor of the overall American job market. Simply put, if one wanted to predict job market conditions in July of a given year, one should examine immigrant apprehensions in January. Orrenius finds that more immigrants attempt to cross the border from Mexico (and more of them are caught doing so) when immigrants believe the U.S. economy would offer more jobs in the near future. One area of the economy that relied heavily on immigrant labor was housing. The following chart plots monthly U.S. housing starts (lagged five months) and remittances to Mexico. ... I use remittances as a proxy for migrant Mexican labor. Immigration and Inequality, by David Card, NBER WP No. 14683, January 2009 [open link]: Abstract Immigration is often viewed as a proximate cause of the rising wage gap between high- and low-skilled workers. Nevertheless, there is controversy over the appropriate framework for measuring the presumed effect, and over the magnitudes involved. This paper offers an overview and synthesis of existing knowledge on the relationship between immigration and inequality, focusing on evidence from cross-city comparisons in the U.S. Although some researchers have argued that a cross-city research design is inherently flawed, I show that evidence from cross-city comparisons is remarkably consistent with recent findings from aggregate time series data. Both designs provide support for three key conclusions: (1) workers with below high school education are perfect substitutes for those with a high school education; (2) "high school equivalent" and "college equivalent" workers are imperfect substitutes; (3) within education groups, immigrants and natives are imperfect substitutes. Together these results imply that the impacts of recent immigrant inflows on the relative wages of U.S. natives are small. The effects on overall wage inequality (including natives and immigrants) are larger, reflecting the concentration of immigrants in the tails of the skill distribution and higher residual inequality among immigrants than natives. Even so, immigration accounts for a small share (5%) of the increase in U.S. wage inequality between 1980 and 2000. We'll see the same close the doors response to immigration we are seeing with trade, and there are short-run and long-run considerations to responding in this way similar to those discussed here. Some Advice for President Obama, by George Borjas: Immigration, both legal and illegal, was the silent issue in the presidential campaign--despite the rapidly deteriorating economic conditions. I suspect that the worsening labor market will force President Obama to wrestle with the immigration issue sooner rather than later. It'll be hard to justify a system that lets in nearly 1.5 million new immigrants each year at a time when millions of Americans are losing their jobs. Our economic woes also create an opportunity - for they will encourage many illegals to return home, potentially removing a red flag that has made rational policymaking politically impossible. The failure of the Bush "comprehensive immigration reform" shows us that many Americans are unwilling to provide amnesty (under any name) to 12 million illegals, especially when the border remains porous and we would simply have to consider yet another amnesty a few years down the road. A real solution is one that resolves the issue for the long term - several decades, at the least. How does the downturn make it easier to address this issue? Simply put, illegal immigration is highly responsive to economic conditions - when times are bad, fewer come (and more return home). President Obama can take a very simple step to complement this "natural" reduction: speed up the widespread adoption of the E-Verify program. This program lets employers compare the records of their new hires with more than 500 million records held by the Department of Homeland Security and the Social Security Administration. A simple scan - no more complex than scanning your bank card at the grocery store - would quickly tell employers if their new hire is authorized to work. Many employers will object - especially those who prefer to hide behind claims that they don't know if any given worker is illegal. Nor does expanding E-Verify provide the "showy" symbol that some politicians prefer - like building a taller and stronger fence on the Mexican border. But any fence, no matter how tall and strong, is bound to be ineffective. Around 40 percent of illegal immigrants don't enter through that border. Instead, E-Verify detects illegal immigrants at the place where such detection is costliest to them - as they try to get a job. It also makes employers more accountable for their actions. It should greatly slow down the number of illegals entering the country. With those tensions reduced, Americans would be much more willing to revisit the issue of what to do with the illegals already here. And a little patience and benign neglect can have a large payoff in this matter. A widespread amnesty may not be needed in just a few years. The deep recession and stricter enforcement will encourage many illegal immigrants to return. Meanwhile, millions of those who remain will sprout deep roots by marrying and having children (who will be US citizens by birth). These family ties will make many illegal immigrants eligible for legal status within existing law. And in a world with greatly reduced illegal immigration, it would be easier to enact minor changes in current law to speed up the granting of permanent visas to relatives of citizens. The economy also presents a unique opportunity for reforming legal immigration. Most of the legal immigrants enter the country without regard to how their skills match our labor-market needs. The lack of any skill filters - combined with the high volume of low-skill illegal immigration - aggravates the economic hardships faced by disadvantaged Americans. We can both improve the status of our low-skill workforce and substantially increase the economic benefits to the nation from immigration by adopting a system that encourages the entry of high-skill immigrants. Surely, in time of economic duress, it's wise to fashion immigration policy in a way that is most beneficial to the country. One little-noticed provision in the failed Bush proposal was the introduction of what is called a "point system" - which awards points to applicants with particular skills, and grants visas only to those who exceed a threshold level of points...Used wisely, immigration policy can be a tool that can help Americans even during difficult times. The new president has a historic opportunity to set the system right. Census Bureau Trashes Social Security Trustees Immigration Assumptions, Beat the Press: [Census Bureau Trashes Social Security Trustees Immigration Assumptions] could have been the headline of an article reporting on a new set of projections for immigration from the Census Bureau. According to the article, immigration will rise from its current rate of 1.3 million a year to more than 2 million a year by the middle of the century. By contrast, the Social Security trustees intermediate scenario assumes that immigration will fall from its current rate to just over 1 million a year by the middle of the century. Even the low cost scenario assumes immigration of only 1.3 million a year by the middle of the century. "The most effective initiative, though politically difficult, would be a major expansion in quotas for skilled immigrants." The only sustainable way to increase demand for vacant houses is to spur the formation of new households. Admitting more skilled immigrants, who tend to earn enough to buy homes, would accomplish that while paying other dividends to the U.S. economy. He estimates the number of new households in the U.S. is increasing at an annual rate of about 800,000, of whom about one-third are immigrants. "Perhaps 150,000 of those are loosely classified as skilled," he says. "A double or tripling of this number would markedly accelerate the absorption of unsold housing inventory for sale -- and hence help stabilize prices."